What is Learning Life’s Citizen Diplomacy Initiative (CDI)? 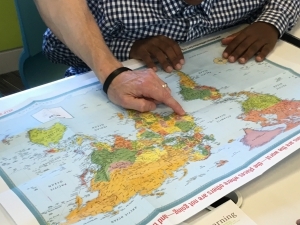 CDI engages lower-income American families, starting in Washington D.C.’s Ward 8, in live internet dialogues and project collaborations with lower-income families in other nations for their mutual empowerment as caring, capable global citizens. 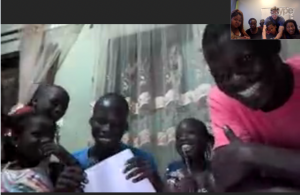 Learning Life conducted its first live, international, family-to-family dialogue on August 27, 2016 between two families in Washington DC and one family in Dakar, Senegal. In what cities and countries does CDI operate? We currently work with families in (1) Washington D.C., USA, (2) San Salvador, El Salvador, (3) Dakar, Senegal, and (4) Jerash, Jordan. What are the goals of CDI? Through CDI, Learning Life aims to nurture more informed, skilled, caring and connected global citizens. Our measurable goals are to improve participants’ interest in and knowledge of foreign affairs, tolerance for difference, social connections to the wider world, and their “civic skills” (e.g., media literacy, research, writing, artistic expression, event organizing, public speaking, etc.) to help them address local to global challenges. Our broader, long-term goals are to nurture global citizenship, democratize diplomacy, and thus help reduce inequality. Citizenship is and has long been defined in national terms, yet nationalism can fan the flames of hatred for other groups. Further, for most of human history, international relations have largely been the province of political and economic elites. We imagine an increasingly interconnected future where people identify first and above all as caring citizens of the world. The internet, laptops and smart phones make it possible to help democratize diplomacy, that is, for more people from different walks of life across the world to participate meaningfully in international governance through dialogue and collaboration. What led Learning Life to start CDI? Learning Life’s founder and director, Dr. Paul Lachelier, organized two successful dialogues between students at Stetson University, University of Paris 8 and the American University in Cairo in 2009 and 2011 (click here and here for brief videos about these dialogues). These dialogues helped inform our collective sense of the potential of internet dialogue and collaboration to help combat the vicious circle of terrorist attacks and xenophobic reactions across the world. What inspired the design of CDI? CDI’s project and internet-based approach is inspired in no small part by “connected learning.” Developed by a team of academics, connected learning is an approach to education in an unequal world that, among other things, encourages the use of the internet, peers, volunteers, and projects resulting in skill-building products to help cost-effectively level the educational playing field for poorer people across the world. See this Learning Life post for more readings that have inspired CDI. What are the eligibility requirements for families? (1) at least one responsible adult (parent, grandparent, aunt, uncle, mentor) and one child age 10-18 willing to participate. (2) parents with less than a bachelor’s degree (4 years of university leading to a diploma). (3) household combined income of less than their country’s median (middle) household income. (4) not taken more than two flights for vacation as a family outside their country of residence. (5) have few or no contacts (family or friends) abroad with whom the family communicates. Are the dialogues free for eligible families? How do the live dialogues work? After screening interested families to ensure their eligibility, we connect 1-4 American families with 1-4 families in a foreign country in which we have an organizational partner and/or willing families. The families meet in a public library, nonprofit office, or their homes. Learning Life provides the families with a volunteer dialogue moderator, a volunteer language interpreter (if needed), and project consultants to assist with the projects. We typically use Skype to connect live via the internet. Projects typically involve five or more family meetings culminating in a live, international, family-to-family dialogue. Meetings occur 1-2 times per month, usually on a Saturday or Sunday, during the projects. 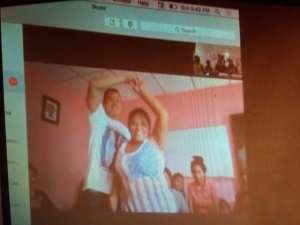 Upon completion of the first project — a community photo project — the American families move on to a food culture project with a family/ies in a different country, thus offering the American families both breadth (in number of countries) and depth (in project collaboration) in their international experience through CDI. The foreign families, in turn, switch from one or more American families to one or more other American families upon completion of a project. In the future, with time and sufficient funding to employ staff on the ground in the communities in which we work across the world, we aim to provide all families with comparable service — including the opportunity to dialogue and collaborate with families across the world — regardless of where they are in the world. Until that time, the foreign families get the concrete benefits of learning about U.S. culture through different American families, practicing English through the dialogues if they wish, and perhaps most importantly, participating in knowledge and skills-building international dialogues and projects that can open doors to better schools and work. We choose the countries based on (a) our personal and professional contacts, and (b) our priority to connect with non-European peoples given that Americans tend to know and travel far less about continents other than Europe. What equipment do the families need to participate? None. Learning Life or our foreign nonprofit partners provide the computers, internet connection and other equipment needed if the families do not have them. We focus on family-to-family dialogue for several reasons. First, there already exists considerable and growing cross-national exchange between schools, businesses and nonprofits, but there is much less attention paid to connecting families. Second, families are too often seen as “havens in a heartless world” or helpless homes in need of protection. Parents and children are vulnerable and do need protection from larger economic and political forces, but they can also be active, even powerful moral forces for peace and development through dialogue and collaboration. Third, putting families in different nations in contact with each other can make international relations more personal and comprehensible, and hence more engaging, especially to less privileged families that may not be engaged in, but are inevitably affected by transnational political and economic forces. Fourth, family-to-family dialogue and collaboration have the potential to (a) strengthen families by bringing parents and children closer together, (b) reinforce school learning by nurturing children’s at-home learning and parents’ support for their children’s education, and (c) reduce inequalities between families of different socio-economic status if the exchanges are focused on less advantaged families. Fifth, it may be a trite saying, but children are indeed the future. If we can provide children with learning opportunities beyond school, within a nurturing family-to-family context, we believe we can increase their knowledge of, interest and skill in engaging with our diverse world. Why focus on lower-income people? International issues — like immigration, trade, terrorism, war, climate change, disease and piracy — affect everyone regardless of class. Yet international business and diplomacy tends to be the province of middle and upper class professionals. Knowledge about and engagement in national and international affairs is not a luxury poorer people can’t afford; it can be crucial to personal advancement and to narrowing stubborn social inequalities in our globalizing world. Through CDI, Learning Life seeks to reduce inter-family inequality by empowering more lower-income people to participate in international affairs. Can you keep me posted as the dialogues develop? Yes, we’d be happy to. You can subscribe to our e-news, and/or like or follow us on Facebook, Twitter, Instagram, or Linkedin to get our latest news as the Citizen Diplomacy Initiative develops. How can my organization get involved as a dialogue partner? Learning Life welcomes queries from potential partners in the cities in which we work (Washington DC, San Salvador, Dakar, Jerash) and elsewhere in Latin America, Africa, the Middle East and Asia. Potential partners should have paid staff or volunteers willing to co-organize the dialogues with Learning Life (this requires regular and prompt communication via Skype, Whatsapp or other means), a quiet place to hold the dialogues, a capable laptop computer, and high-speed internet. The internet connection needs to be strong enough to allow a decent quality video dialogue with little delay in transmission, and few if any dropped calls. Interested organizations can contact us at email@learninglife.info. See our website’s Dialogues Page about CDI for several ways you can volunteer. Please email us at email@learninglife.info.